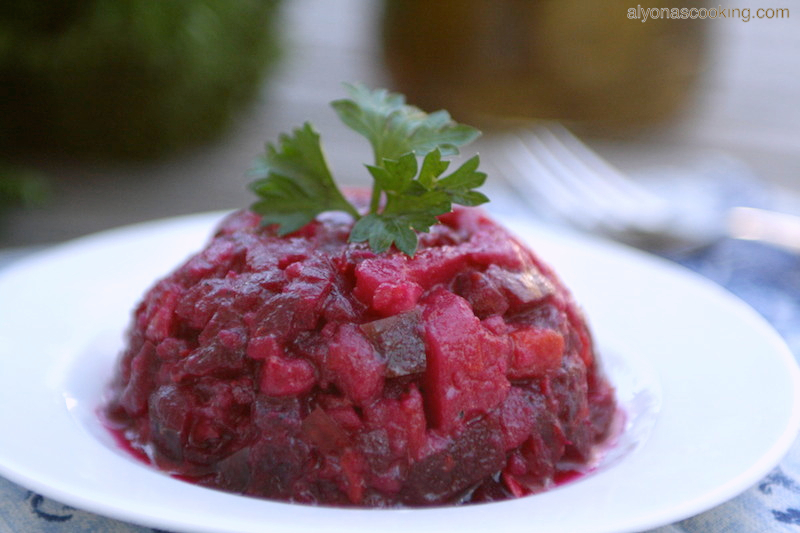 Vinaigrette Salad (винегрет салат) is a well known beet salad through out the Slavic culture. 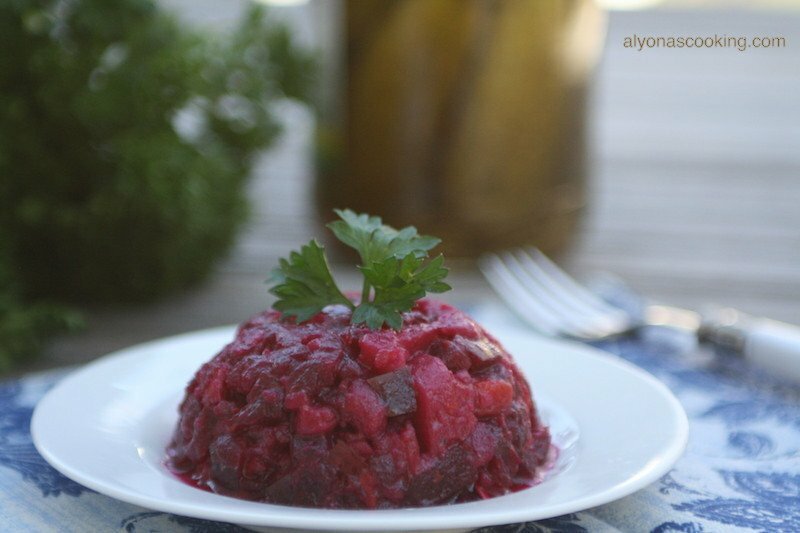 A combination of tender beets & potatoes are cubed finely to create a light and delicious salad. If you have ever attended a Ukrainian or Russian wedding you may have tried this salad among the many. I happen to love my mom in laws version which is so simple yet delicious. The beets and kosher dill pickles are the key ingredients to this salad which are used in proportion and balance out all the flavors nicely. This salad is not at all overpowering with a certain ingredient as there is a variety of nutritious veggies, creating an enjoyable melody of amazing flavors. It’s kind of like a beet potato salad but requires no mayonnaise making this very light. 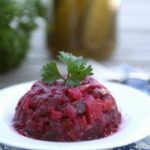 There are probably many different ways to make this well known favorite but the general idea is to use a vegetable blend of potatoes, beets, carrot & onion. 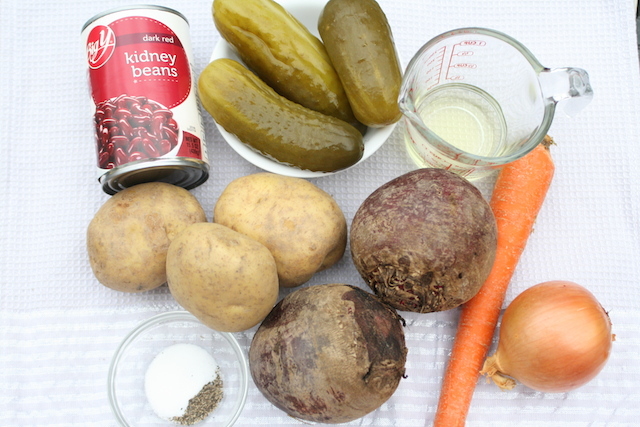 Then a choice of sour kraut or brined pickles are added to the vegetable blend along with a choice of beans or peas. I happened to use only half a can of kidney beans which is not overpowering for this salad. This is my ultimate favorite way of making this Classic version. Don’t forget to comment and rate below. 1.) Place beets, carrot and potatoes into a large pot; cover with water and bring to a boil. Once boiled simmer over medium heat until tender. (I boiled my potatoes and carrot for about 45 min then the beets for an additional 15 min.) When vegetables are tender remove from the water and set aside to cool. 2.) 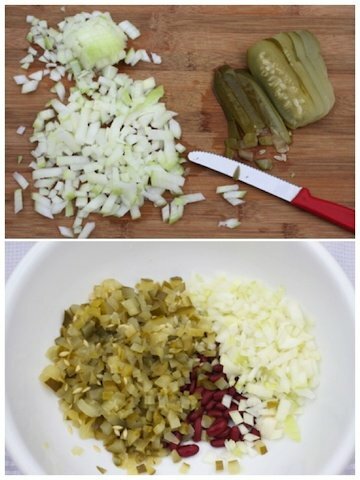 Meanwhile dice the pickles, onion and drain and rinse the beans; place into a large bowl. 3.) 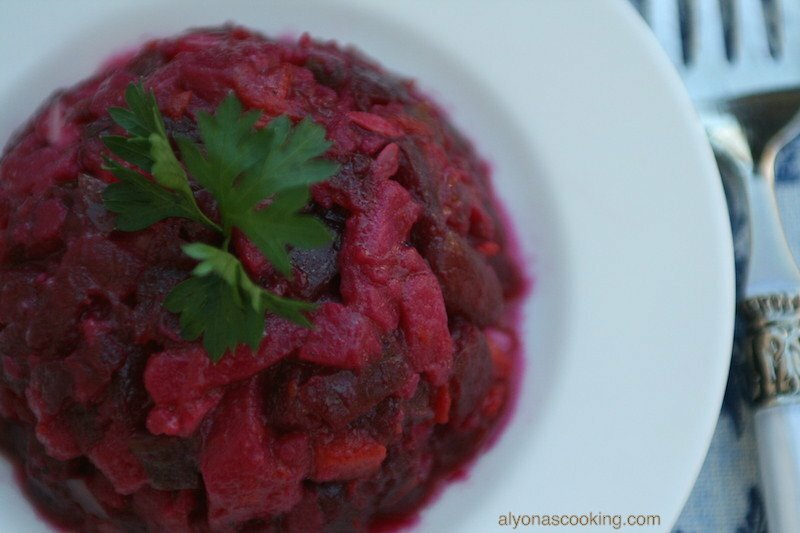 When the beets, potatoes and carrot are cool enough to handle, chop into small cubes; add to the pickle mixture. Add the salt, pepper and oil and toss everything together. Refrigerate at least a few hours for flavors to set. The longer the beet salad marinates the darker it gets from the beets. 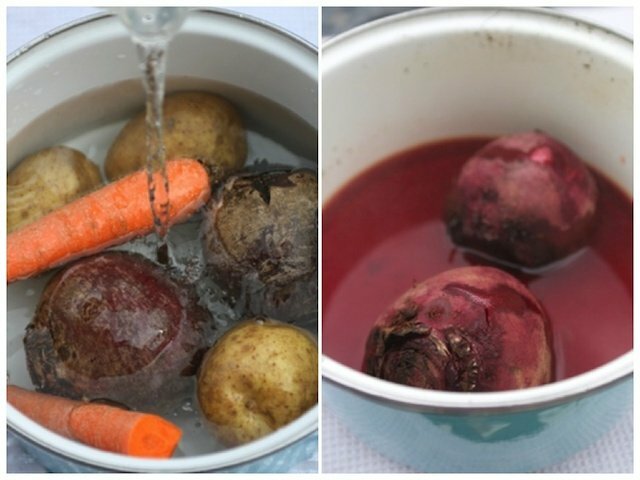 Place beets, carrot and potatoes into a large pot; cover with water and bring to a boil. Once boiled simmer over medium heat until tender. (I boiled my potatoes and carrot for about 45 min then the beets for an additional 15 min.) When vegetables are tender remove from the water and set aside to cool. Meanwhile dice the pickles, onion and drain and rinse the beans; place into a large bowl. 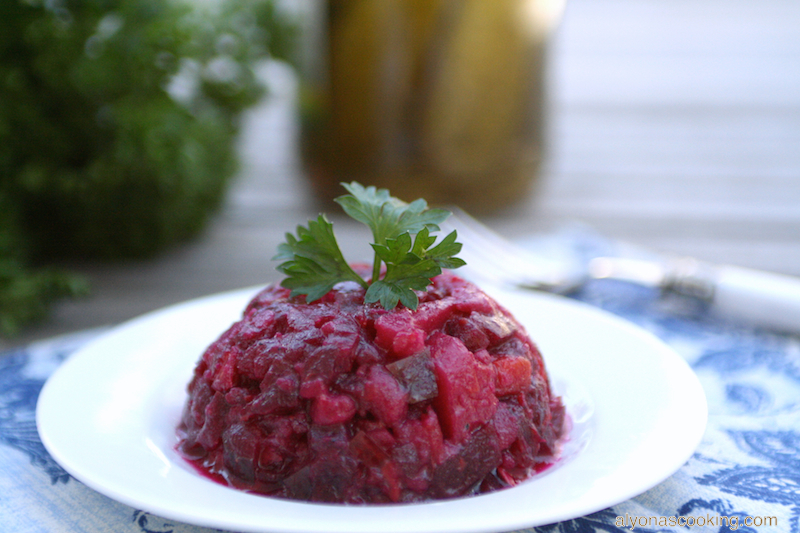 When the beets, potatoes and carrot are cool enough to handle, chop into small cubes; add to the pickle mixture. Add the salt, pepper and oil and toss everything together. Refrigerate at least a few hours for flavors to set. 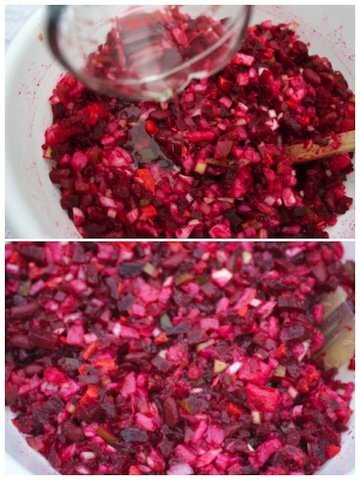 The longer the beet salad marinates the darker it gets from the beets. I made this after the Salat Olivye turned out so well. This one was great too! I will make both recipes regularly.